I'd like to welcome everyone to the inaugural edition of, "NexGen Interviews." 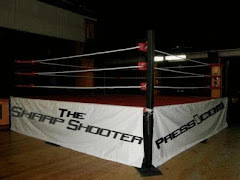 What that is, is a project dedicated to helping out the true up and coming stars of the wrestling industry and giving them some spotlight and exposure as they grow and develop into becoming the next generation of Pro Wrestlers. The first young man I am going to introduce to the world is one, Alex Avgerinos. A 17 year old athletic young talent who is all over North Carolina territories, "AA2" is a fan favorite amongst every territory he has been in and he did win the Krazy 8 Tournament held in North Carolina, a very prestigious honor for such a young competitor. Today, I was able to talk to the youngster as he discussed many topics. I hope you enjoy this interview and learn something new about one of the newest young stars in Professional Wrestling today, one, Alex Avgerinos. Rallo: First off, I'd like to thank you for taking the time to do this interview. My first question is quite simple. For those unaware, tell us a little about where Alex Avgerinos comes from. Also, where does your passion for wrestling come from. Where there any names you watched growing up that inspired you to pursue this career? When deciding to become a wrestler, who did you have as your biggest supporters and or doubters? Were there any important people in your life that helped you especially in terms of your wrestling dream? Who motivated you in and outside of the ring? When you think of Pro Wrestling and video games, one name comes to mind: Player Uno. Player Uno is an independent Professional Wrestler who has worked all over. From his stint in CHIKARA to ISW to ROH, Uno has brought his unique style of wrestling with him that has entertained each and every fan who was in their seat. I was recently lucky to talk to Uno about many topics in wrestling today. Hope you enjoy! Rallo: First off, I’d like to thank you for time to do this interview. My first question is, growing up in Canada, the home for some of the most legendary wrestler of all time, how did your quest of becoming a Professional Wrestler begin? Who did you view and idolize when you were young that made you decide that this was the correct profession choice for, yourself? Were there any moments that you viewed in Pro Wrestling that also motivated you to pursue this work? Who were your major influences in and outside of the ring? Every organization features their, “Founding Fathers.” These men that build the foundation and up for where they work. In Pro Wrestling, WWE can thank the likes of, Hulk Hogan for revolutionizing the organization as a whole. In one organization, Ring of Honor, there have been a set of men who built and revolutionized the art of, Pro Wrestling. One of these men, is, Nigel McGuinness. McGuinness was one of the most talented wrestlers in the entire world. Known for his technical ability and brutality in the ring, on top of his whimsy charisma, Nigel has traveled the globe. Known also, as, Desmond Wolfe, in, TNA Wrestling, too many. Today, I got to talk with Nigel on a variety of topics. Enjoy! Rallo: First off, Nigel, I’d like to thank you for taking the time to do this interview! First, I must ask where your passion for the Professional Wrestling began? Growing up in the, United Kingdom, who were some wrestlers you watched and admired that ignited your passion for Professional Wrestling? When did you decide you wanted to pursue this career and who were your biggest influences, in and out, of the squared circle? Recently, I was able to talk to A.J. Kirsch, a competitor on this past season’s, WWE Tough Enough broadcast. A.J. was eliminated in the 8th episode of the show, which was eventually won by, Andy Leavine. However, A.J. is not a wrestler to be overlooked. Recently, I was able to speak to Ring of Honor talent, Adam Cole. Cole is one half of one of the most young and unique tag teams in the world alongside his partner, Alex O’Reilly. Both are incredibly talented individuals who bring their exciting in ring abilities to ROH’s prominent tag team division. The current CZW Junior Heavyweight Champion is also going to be one of the many great tag teams capturing the minds of many on ROH television, presented by the Sinclair Broadcast Group. Now with a deal on TV, Cole and O’Reilly will bring tag team wrestling to a whole new level, one which WWE and TNA have not seen in years. I got to speak with Cole about a wide array of topics and hope you enjoy this interview! Rallo: First off, I’d like to thank you for taking the time to conduct this interview! My first question is, why did you become a Professional Wrestler? Who were inspirations you watched that you felt motivated you to pursue this career? Where did the passion and the drive to wrestle come from and who were your biggest inspirations in and out of the squared circle? Recently, I was able to interview former WWE Superstar, Shawn Spears. Known as, Gavin Spears on WWE’s version of ECW in, 2009…there is more that meets the eye than what the WWE Universe has seen on their televisions in 2009. Spears is a very passionate talent who has been able to work all over the world in a plethora of different performers. One of the best performers wherever he goes, Shawn Spears was kind enough to let me conduct this interview with him. Hope you all enjoy! Following some recent controversy on Twitter by former WWE NXT Rookie and Nexus Member, Tyrone Evans a.k.a., Michael Tarver, / was able to send some questions his way in terms of his candid thoughts of the WWE, FCW, John Cena as well as some of his other life pursuits. I hope you enjoy this interview and I thank Mr. Evans for the time to respond to my questions. Rallo: I’m just going to start off simple and ask of your beginnings. Who were your major influences in life? Who was the person or persons that inspired you to aspire to become a professional wrestler? Where did your wrestling pursuits begin? Where does the story and the inspiration of Tyrone Evans begin? Evans: My major influences are my parents ,my mother was a strong minister and my father was also but he was a boxer and I watched him work himself to death almost to take care of us. He went from playing for the Denver Broncos to working in a racist country club to support his family. That mad me feel like I am strong enough to do anything and I was always a wrestling fan watching NWA and WCW . I started training in Akron Ohio at the Shamrock night club in 2004 ,and have been doing it since. Rallo: First off Mr. Dean Roll (Shark Boy), I would like to thank you for taking the time for this interview. Over the years, you have been one of my favorite Superstars to watch on Impact. The first question is, how did it all begin? When and why did you even want to be a part of this profession? 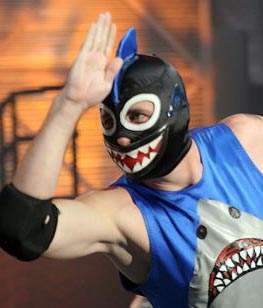 Shark Boy: My earliest wrestling memory was tuning in to the WWF episode where “Rowdy” Roddy Piper blasted Jimmy “Superfly” Snuka with the coconut when I was about 10 or 11 years old. For some reason, I had never been so fascinated by anything in my life. I was hooked and almost immediately started telling people that someday I was going to be a professional wrestler. 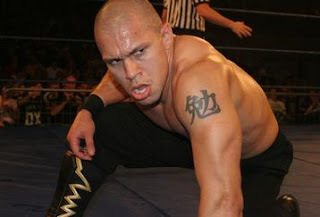 Recently, I had the time to interview former WWE and TNA star, Low Ki (KAVAL). Low Ki is known internationally as a top notch talent with experience from some of the biggest promotions all over the world. He was last seen in the WWE as KAVAL, and since his release has been relatively quiet in terms of his future. I got to ask Ki many various questions based on his humble beginnings to his growing popularity all over the world as well as his future plans. I hope you enjoy this interview as much as I did conducting it! Thanks again to Low Ki for having the time to conduct this interview. Rallo: First off I’d like to thank you for taking some of your time to conduct this interview. I’m very grateful for this opportunity. My first question has to be what it was like growing up to be so tall in stature and also how did you remain in such good athletic condition? Was growing up amongst your peers difficult or was it something that never really bothered you? 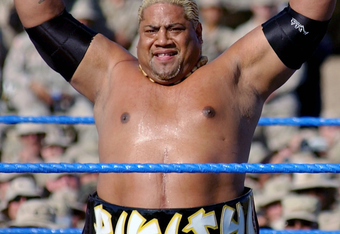 Earlier this week, I was fortunate enough to have a conversation with former Superstar of World Wrestling Entertainment and Total Nonstop Action, Rikishi (Solofa Fatu). Fatu is the nephew of WWE legends The Wild Samoans and Rocky Johnson. He also is cousins with former WWE Superstars, Dwayne “The Rock” Johnson, Samu (WWF), Yokozuna, and Rosey. Fatu is brothers with Umaga and The Tonga Kid.